The New York Times-bestselling zombie series FUBAR returns with an all new giant-sized two issue miniseries. 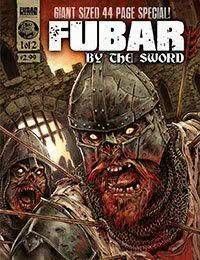 The first oversized issue in this series shows what happens when FUBAR goes medieval on the walking dead with five brand-new stories of ye olde zombie-stomping madness! If youre new to FUBAR, nows the perfect time to jump on board!